That's right, you can say it, I'm weird. 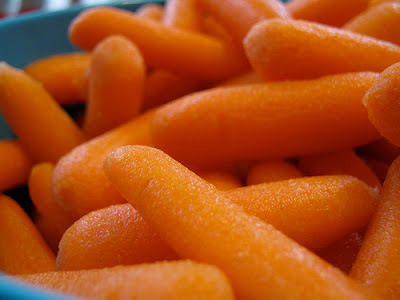 But it's not just me who likes to eat carrots in the shower, it's my two year old daughter, Philomena who started it! (I know, real mature to blame it on the two-year old, right?) She has this thing for eating raw baby carrots in the shower, while watching TV, walking around the theme park, playground, YMCA or in the shopping cart at the grocery store. The ironic part of this is that she refuses to touch a baby carrot if I put it on her dinner or lunch plate. Oh, and her and Blaise won't touch raw "adult" carrots either. Blaise won't eat homemade almond butter without it being a 50/50 split with valencia peanuts. I've slowly weaned the peanuts out and he finally likes straight almond butter (shh... don't tell him, he doesn't know yet - I just call it nut butter now). Blaise won't touch celery unless it has almond butter and a couple raisins on it (aka, ants on a log). He has to choke down broccoli salad, but once I put a whole 10 or less raisins in it, he miraculously eats the entire meal as if it has been transformed! His fresh spinach salads usually need to have sunflower seeds, raisins and a sprinkle of grated Parmesan cheese. Yes, he is my picky eater, but the way I see it is that I can't complain, he's eating raw spinach salads. Finally, he won't touch any form of milk (smoothie, homemade ice cream or straight) without it having a touch (literally 1 tablespoon or less) of my husband's grass-fed whey protein concentrate. It adds a touch of a vanilla flavor and now he is FINALLY drinking milk after years of trying so many unsuccessful methods (including bribery and yes, I did resort to begging a couple of times - don't judge). Philomena won't eat baked sweet potatoes, but she will eat the skin or eat them as baked sweet potato fries. She usually doesn't drink smoothies unless it comes from Michael's cup or eggs unless they are from my plate. Something about being ours just makes it taste better. I know you parents out there know what I'm talking about!